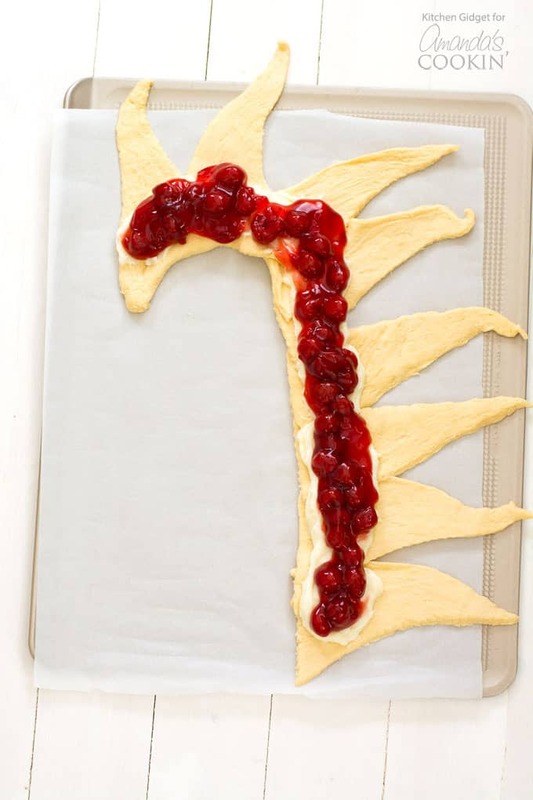 Try this festive Candy Cane Danish – cherry cheese pastry in the shape of a candy cane! This gorgeous candy cane danish is easy to assemble with crescent rolls, cherry pie filling, and sweetened cream cheese. It’s a fun Christmas breakfast treat to make with kids! For those of us that celebrate, Christmas is the most wonderful time of the year! I love hearing how others celebrate and the traditions they’ve cultivated with their families. For myself, I have cherished memories of family traditions that–more often than not–revolve around food. Another favorite tradition involves the morning of. As we wait for everyone to wake up before opening presents, we like to enjoy a slice of potica with a cup of coffee. Potica is nut roll pastry from my Polish heritage. My father makes and delivers them as gifts on Christmas Eve to lucky recipients. 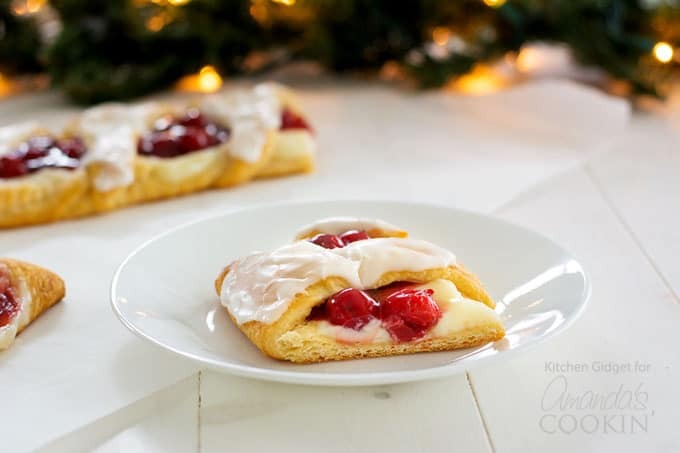 Use a silpat or parchment paper so you can easily lift the candy cane danish from the cookie sheet. A rimless insulated baking sheet will also allow you to slide the danish off rather than trying to lift it, running the risk of breaking it. After forming the crescent cane shape and adding the filling, start from the top of the cane to fold the triangles over. Gently tuck the ends along the length of the pastry. Be sure to add the icing while the danish is still quite warm. The heat from the danish will melt the icing a bit allowing it to level out nice and smooth. Chances are you won’t use all the pie filling. If that’s the case save it for some hand pies! After adding the icing, use an icing spatula or small rubber spatula to clean up any filling that may have spilled out during baking. This year, I have a new pastry to add to the morning breakfast table – this candy cane danish. 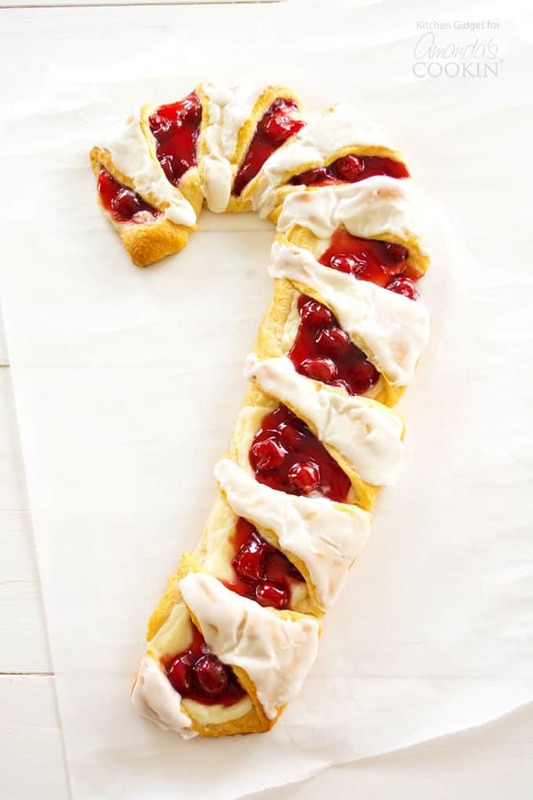 It’s really a cherry cheese danish baked into the shape of a candy cane and it is so festive! 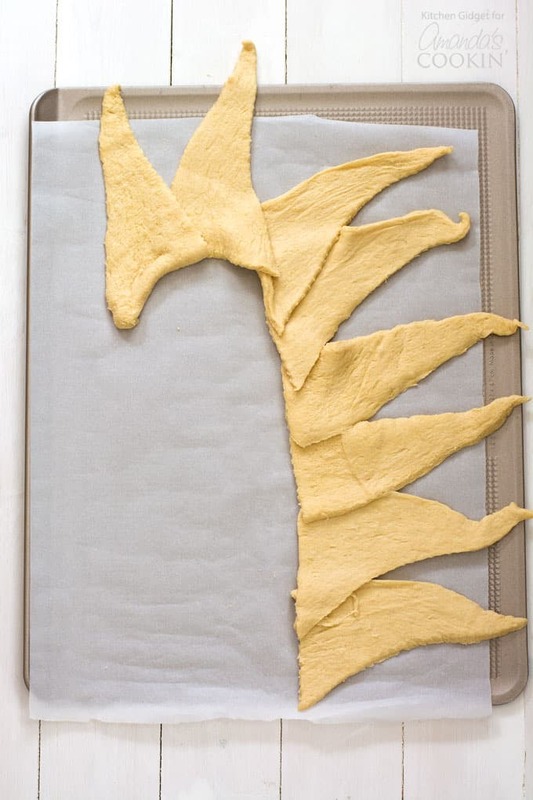 Plus, it’s made with refrigerated crescent dough, so it’s fast and easy to put together. You can use store-bought pie filling or homemade cherry pie filling if you put some up this past year. 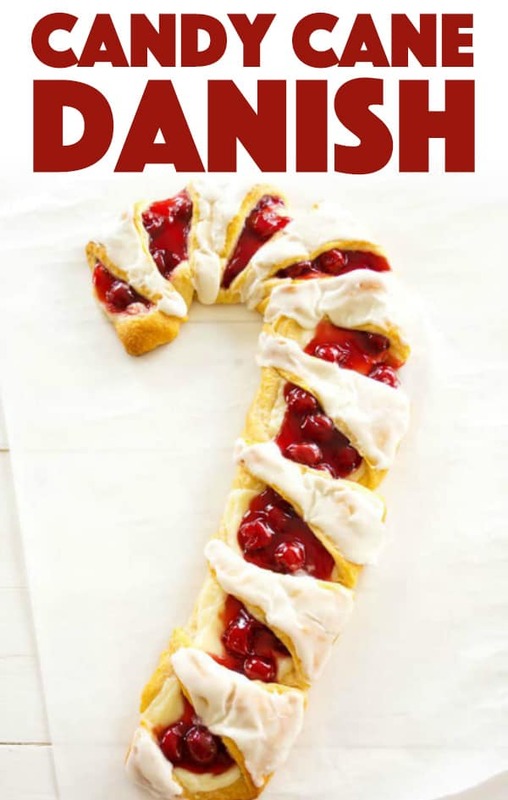 The cream cheese filling in this candy cane shaped danish can be flavored with vanilla or a blend of vanilla and almond extracts. The almond complements the cherries so well. I’ve included pictures for guidance, but simply align four crescent triangles in a straight line, slightly overlapping. With the fifth crescent, begin curving the head of the cane. 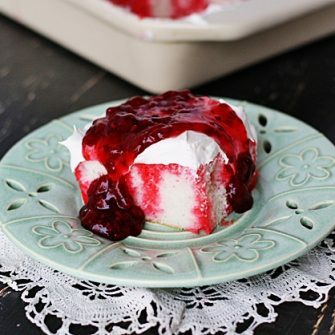 Top with cream cheese and cherries, then fold over the points of the triangles. After baking, frost with a simple white icing to complete the candy cane stripes. Hope you enjoy and have a happy holiday season! If you’re looking for another delicious breakfast option check out this Raspberry Coffee Cake. or our Breakfast Casserole with Ham and Cheese. So yummy! Before you jump into the printable recipe, watch the video on how to make this delicious candy cane danish! This delicious pastry is shaped like a candy cane and perfect for Christmas morning. 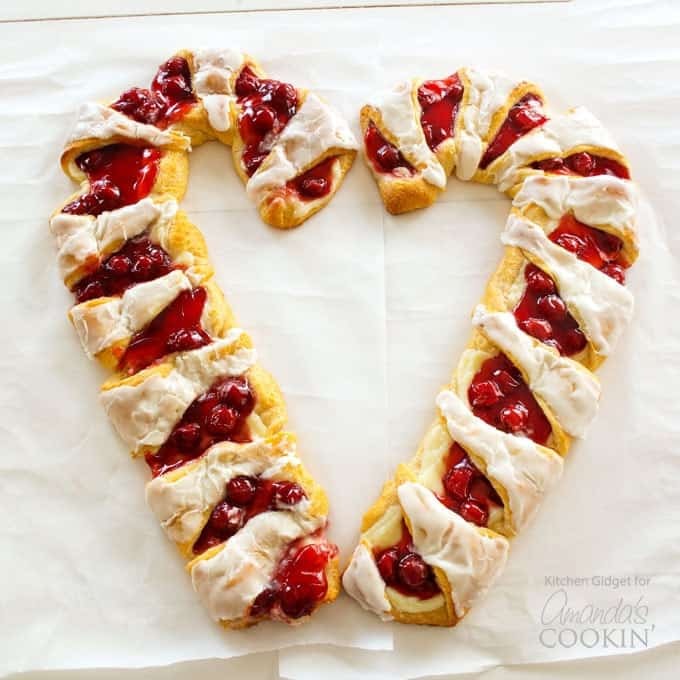 Learn how easy it is to make this candy cane danish yourself! My niece made this for our family Christmas breakfast this past Christmas 2017. It was a big hit. Now my husband wants me to make it for him. Maybe I’ll make it in the heart shape for Valentine’s Day. What a fun idea! I made it for Christmas with a raspberry filling instead of cherry and added almond extract. it was so good! My family loves it and i have to make it again for my hubby, there goes the calories, lol? Thanks Yassy! I actually made it on Christmas morning with red raspberry pie filling and added use almond extract in it. it was divine! This was a hit for Christmas! Thanks for the great recipe! just made this for Christmas Eve, but had trouble getting it off the baking sheet, to a platter, any suggestions on how to do this without breaking the cane. I think it could yes! Thanks! Going to make it for a holiday gathering next weekend! The recipe will not print. Looks delicious and so easy. Hi Debbie. Sorry you had trouble printing, sound like it might be a browser issue. I actually just printed this yesterday as I’ll be making it Christmas morning! i’ll email you a copy. What a great idea! Will definitely make this! Thanks for sharing! How can this be stored? I would store it covered in foil or plastic wrap in the refrigerator for up to three days. Love the candy cane danish. It is delicious and quick and easy to make.